* The first quotation is the renowned and often quoted locus of Silius Italicus, Punica 13.663: “Ipsa quidem virtus sibimet pulcherrima merces”. With this trifle wants to wish to the possessor [of this album] every possible happiness Jeremias Sterky, doctor and professor of theology, and senior pastor of the Reformed Church. 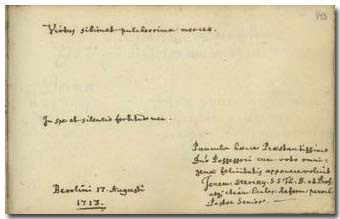 In Berlin, on August 17, 1713. Jeremias Sterky was senior pastor of the Reformed Church in Berlin, and professor of theology in Frankfurt an der Oder. He died on July 29, 1718. The funeral sermon held by Paul Volckmann on this occasion was published: Die mühsame Schiff-Fahrt des zeitlichen Lebens, als … Jeremias Sterky … am 29. Jul. des 1718ten … Jahres … in die Ewigkeit versetzet … worden, Jn einer Abdanckungs-Rede vorgestellet … Berlin, 1719.